Who like’s wearing wet socks? We don’t! This is an issue that every sock company has invested a lot of resources into trying to fix. Only Dahlgren has actually found a solution. So, how did they do this? By breaking the sock into separate zones. Absorption zone. Your foot sweats primarily in two places so Dahlgren has set up an absorption zone in these two areas. Transfer. Once this sweat starts pooling in the absorption zones it needs to be transferred away. This is achieved mechanically through Wicking channels and rings which is a specific design in the weave to pull sweat from the absorption zones to the top of the sock. Release. The top of the sock is exactly where we want the sweat to go. Why? Because this is where it can fully escape your shoe/boot. This is the evaporation zone. 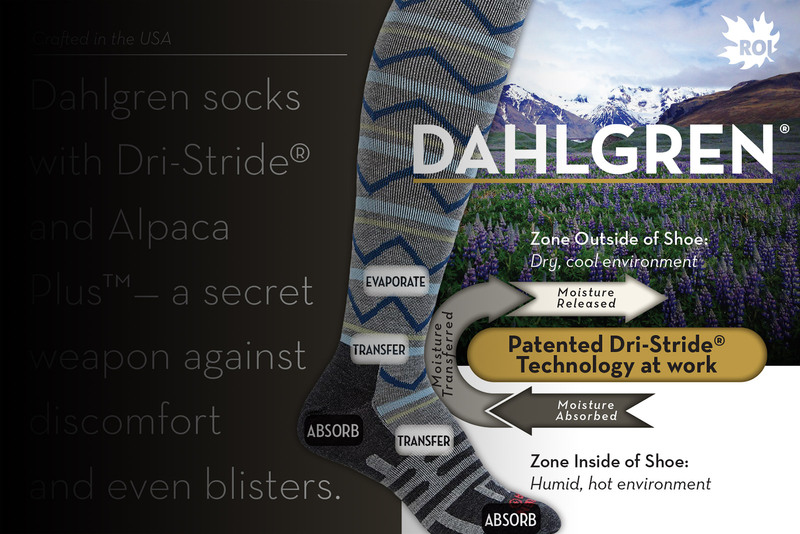 This patented technology is called “Dahlgren Dri-Stride®”. At Treksta we believe fully in the products we supply and actually testing the gear is a big part of what we do. We have seen these socks in action and it’s insane to see how much moisture ends up in the evaporation zone and how dry our feet stayed.